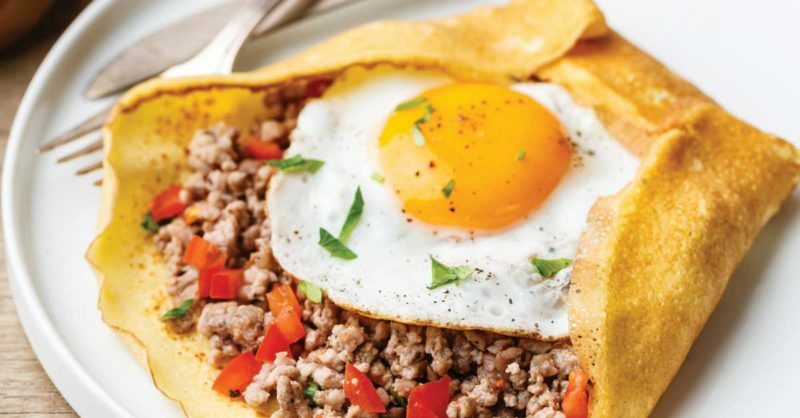 Before making your crepes, you’re going to want to prepare your homemade breakfast sausage. This isn’t just any old sausage recipe either — this recipe makes for some ridiculously tasty breakfast sausage that’s bursting with sweet and spicy flavors. 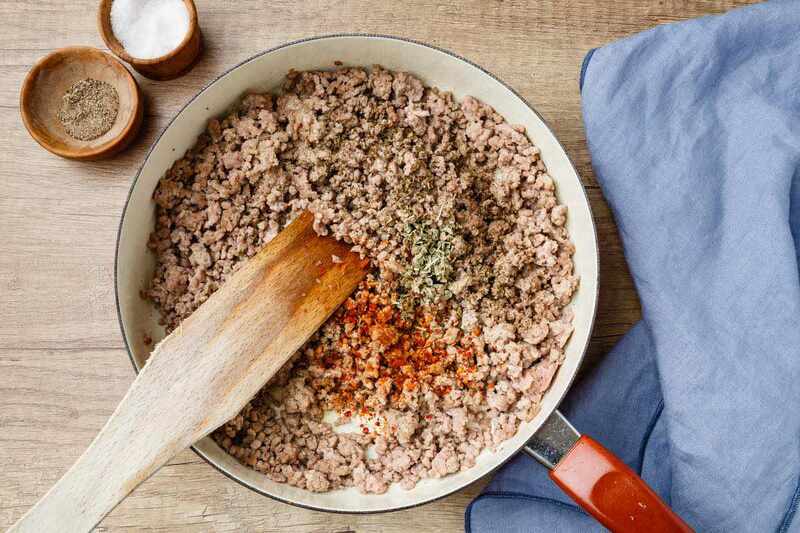 You’ll be using ground pork for the sausage, cooking it for about 8-10 minutes in olive oil. Next, you’ll be adding a delectable combination of ingredients to add an immense amount of flavor to things. You’ll be using salt, pepper, dried thyme, dried sage, onion powder, cayenne pepper, and maple syrup. You can also optionally add some red pepper flakes if you’d like your sausage to be just a little bit spicier. After combining everything, remove your sausage from the heat and set aside while you turn your attention towards making the crepes. I love adding a bunch of herbs and spices to my sausage recipes for two big reasons. First and foremost, they add an unreal amount of flavor, making the sausage even tastier. Second, I usually try and cook with herbs and spices as often as I can anyway, because they’re also loaded with disease fighting antioxidants (1) that help to really make these paleo recipes an excellent choice for healthy meals that contain a decent amount of protein. It’s rather straightforward to prepare your crepes as well. 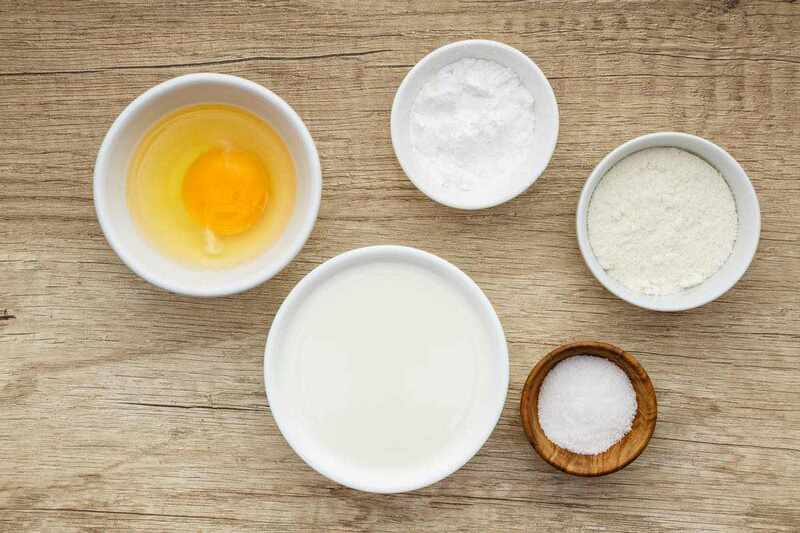 Simply combine your coconut flour, arrowroot flour, baking powder, and salt together in a bowl. Using coconut flour and arrowroot make sure these crepes are gluten free and much easier to digest than if they were made with refined wheat flour. They’re both much more nutritious as well, adding a nice amount of protein, healthy fats, and fiber to your crepes. 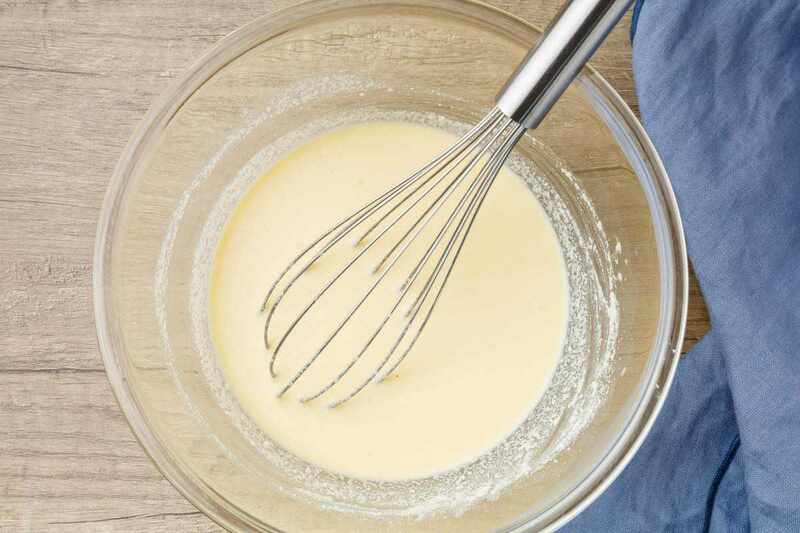 In a separate bowl, combine your eggs and almond milk and then whisk them together. Just as the coconut flour and arrowroot flour keeps the crepes gluten free, using almond milk will help to keep them dairy free as well. Almond milk is also a great source of B-complex vitamins and essential minerals like calcium, zinc, and magnesium. Just be sure to use either homemade or otherwise unsweetened almond milk. Next, combine your almond milk mixture with your coconut flour mixture and then cook the crepes. After cooking the crepes for a few minutes, place them on a plate. 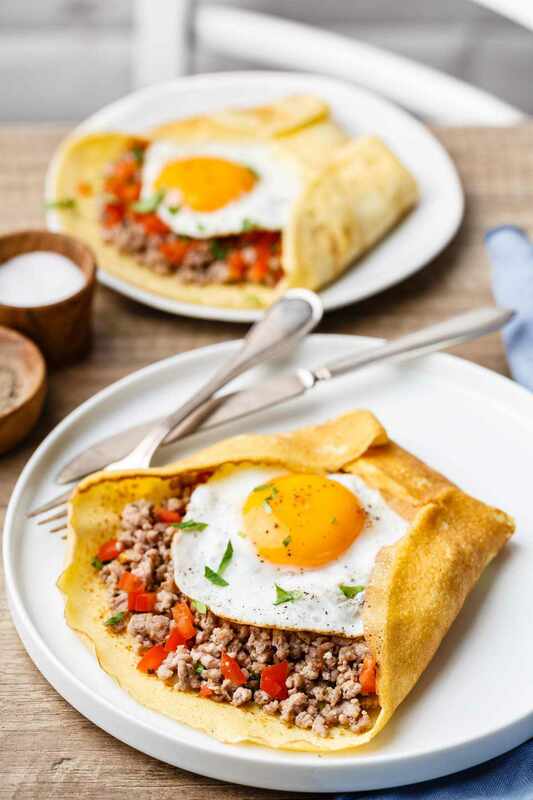 You can now finish things off by placing the homemade breakfast sausage on one half of the crepe, sprinkling it with the chopped tomatoes, and then finally topping with a fried egg. Fold the crepe inwards and voila, you’re all set to enjoy one incredibly well balanced breakfast meal that not only tastes delicious, but also provides your body with tons of nutrients and energy to start your day off on the right foot.